Unlike the derge regime, the current ruling party EPRDF devolves its power to the federal and regional government. In the same line, each regional government also formally devolve adequate decision-making power to lower administrations level. This aims at promoting decentralisation and getting the people together. Consequently, each regional government level has among other things, the right to use its public administration, recruit, transfer and promote. This research attempts to assess the implementation of HRM functions in SNNPRG under a decentralised context in Ethiopia using questionnaires collected from five sectors and secondary official HRM documents of the region. The finding reveals, better performance of HRM practice compared to centralised administrative system. However, promotion, performance assessment and reward system are not performed well as there are some indications from the findings. Moreover, to some extent the current wage structure and the minimum requirement criteria set by CSA hinder sectors effort to attract the best candidates. Similarly, selection often distorted by interference. The study also depicts the need for additional training, as the performance at the zone and woreda level is not satisfactory. Besides, in some instance, lack of equal access for training and need assessment is also improper. The execution of ROPA also shows that the need to make the working environment more conducive. Like wise, in some sectors, the uniform salary scale the country follows does not attract various professionals and hence not fully improve service delivery. Finally, the support of CSA to the sector bureaus is minimal. Despite the above stated problems in the region, there is a positive link between decentralisation and HRM as it gives each level of government to exercise their power in making decision on HRM issues with out waiting another decision maker. Moreover, conducting training, creating strong link between performance and reward, making the performance assessment system more open and carrying out continuous follow up should make the decentralisation process more sustainable. 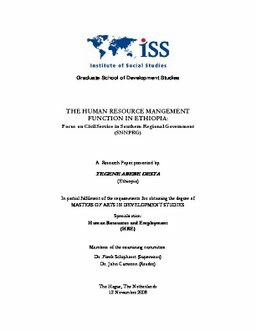 Relevance to Development Studies: Effective HRM and HRD is a corner stone for institution building in the public sector, which in turn has an impact on the development performance of the country in general, and the region in particular. As the finding shows, in the regional government there is a positive relation ship between HRM and decentralisation. However, some of the function for instance, promotion, performance assessment and reward implementation is sluggish. Similarly, Linkage between reward and performance is loose, training is inadequate and access is uneven. Related to this, in some sectors the homogenous salary structure does not allow them to attract the best candidates. Therefore, this research helps the writer to identify the gaps in the regional government and to make recommendations for the way forward.